Boston’s Chief of Housing and Director of the Department of Neighborhood Development, Sheila Dillon, spoke with members of B’nai B’rith Housing’s Gen2Gen Program on Tuesday evening. B’nai B’rith Housing (BBH), a Massachusetts nonprofit whose mission is to produce affordable housing to ease the housing crisis in Greater Boston, hosts several Gen2Gen events throughout the year in an effort to connect both emerging and experienced industry leaders to educate and encourage dialogue around housing and other urban issues. Gen2Gen is a coalition of young people who care deeply about finding innovative housing solutions, and the program is one of BBH’s strongest tools to keep the conversation about the housing crisis front and center. As such, Ms. Dillon was a perfect fit for an industry leader event. During the conversational interview and Q&A session at Suffolk University’s Sargent Hall, Ms. Dillon reflected on her career path and experiences, shared her insights on current housing policy, and discussed her aspirations for strengthening our communities and our region. The discussion, which was moderated by Jesse Kanson-Benanav, B’nai B’rith Housing Senior Project Manager, covered how the Walsh administration is working to expedite the timeline and process for permitting and funding affordable housing projects, the importance of the Community Preservation Act, and the application of inclusionary zoning guidelines. Dillon spoke candidly about the need for additional workforce housing solutions, the rise and role of the YIMBY movement, and her pursuit to get more affordable housing funding legislation to come to fruition. 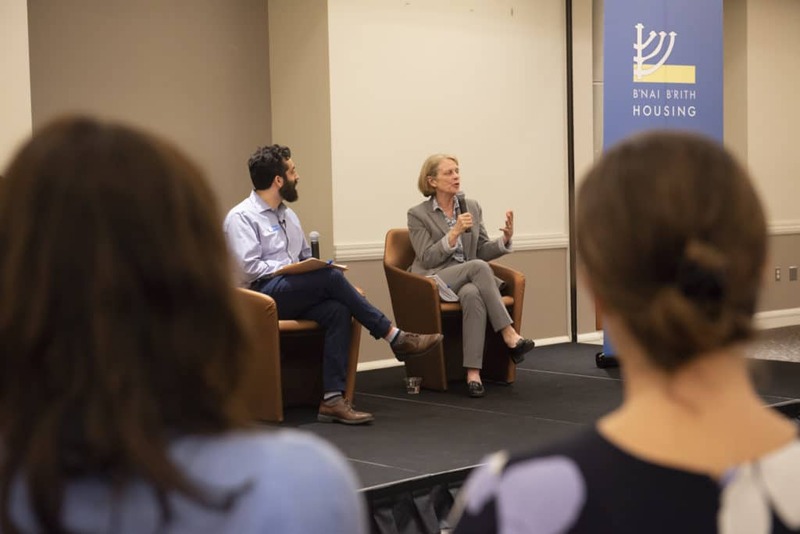 She encouraged the audience of advocates to come to her office with ideas and questions, stressing the potential they have to make an impact on policy and new solutions. BBH staff, along with the Gen2Gen Steering Committee, is actively planning events for the coming year. The group looks forward to participating in September’s YIMBYtown 2018, a national conference aimed at identifying problems, creating solutions, and sharing resources on the issues that impact housing, this year being hosted in Boston. Individuals interested in joining Gen2Gen should click here or contact Naomi Levine, BBH’s Fundraising & Communications Manager, at 617.283.6087 or naomi@bbhousing.org.